Adding A New Addition? Get Prepared! When you are starting a new family—or adding to your family with a new bundle of joy—there are lots of things to do to get ready. Nesting moms may find themselves doing all sorts of crazy cleaning in preparation. If you have been pregnant before, you know the strange impulses that hit you to create a space for your little one. Some of them are totally reasonable and necessary, like set up a crib and bedding. Some of them, your child will probably never feel the impact of, like sorting through all your coffee mugs and getting rid of the ones you don’t use any more. But while you are nesting, or preparing for a new addition to your home, it is definitely a great idea to schedule a carpet cleaning. Now don’t stress too much about getting this done before the baby is born. If it doesn’t happen, that’s okay! It is going to be a few months before your baby can roll off of their blanket and onto the unknown grime on your carpet. But certainly before your baby starts rolling and crawling, you are going to want to get your carpets professionally cleaned. When a baby starts crawling, there are lots of face plants, and let’s face it, putting their mouth on the carpet just for the fun of it. You will never be able to protect your child from every germ and bit of dirt. But certainly, having your carpets cleaned for baby will add to your peace of mind and the health of your baby. 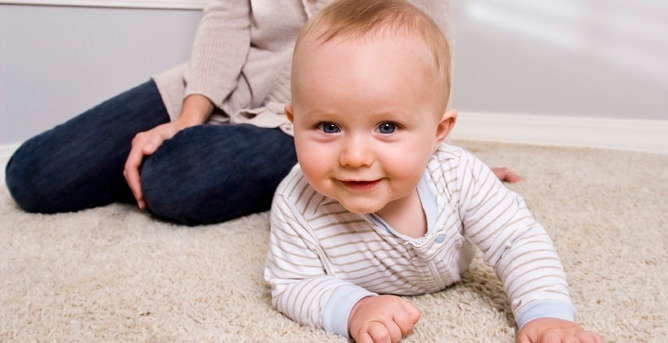 For more information on carpet cleaning for your new little one, contact us today at Clean USA.